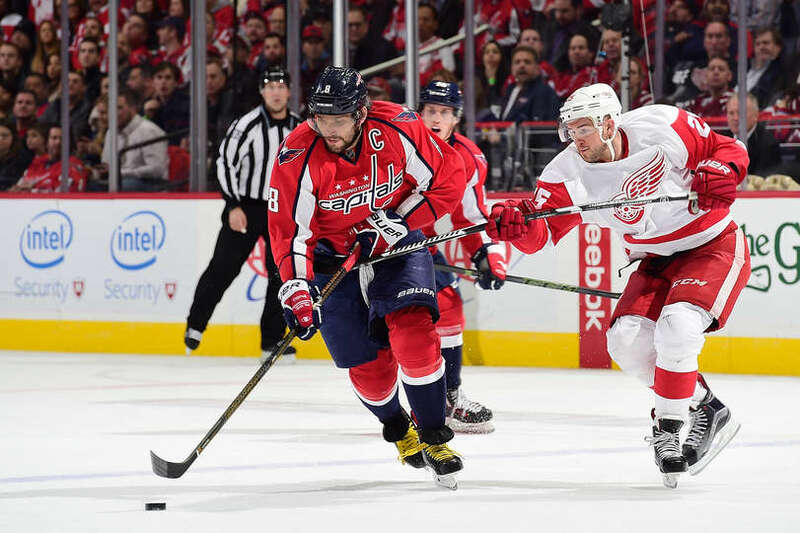 These accomplishments may have been overshadowed, however, with Mike Green making his return to the Verizon Center for the first time since signing with the Detroit Red Wings as a free agent this past off season. Even though he was wearing a Red Wings sweater, Green managed to help his former team by turning the puck over in his own zone less than a minute in. Kuznetsov put a shot on net that Williams scooped up for an easy rebound goal. Washington improved to 13-1-0 this season when scoring first. Detroit later evened the score when Dylan Larkin slipped a pass between Taylor Chorney‘s legs directly onto Henrik Zetterberg’s stick to put the puck past Braden Holtby (21 saves) from right in front of the crease. A defensive breakdown led to Detroit taking the lead. Dmitry Orlov gave up the puck in a weak turnover while his defensive mate Chorney was caught lagging behind the net. With a lot of time and space, Detroit’s Thomas Jurco lifted the puck right past Holtby. Detroit goalie Jimmy Howard did everything he could to prevent the Caps from doing any damage, making some amazing saves on a Caps power play opportunity to keep Detroit in the lead for the rest of the second period. The Caps led in shots 28-15 but were behind on the scoreboard 2-1, the first time in ten games the Caps have trailed after the first two periods. Green then came back to help the Caps again when he committed a holding penalty on Alex Ovechkin in the third, giving the Caps their third power play chance of the night. Once again, a stifling Red Wings defense and the swift hand of Jimmy Howard kept the Caps off the score sheet. But as many teams know, you can only give the Caps so many opportunities before they inevitably get a goal. Ovechkin crashed the net after a Nicklas Backstrom shot went array and free in front of the goal on the fourth power play opportunity. Skating in quick, Ovechkin powered the puck in from right in front of Howard. After another coach’s challenge, the goal was upheld and Ovechkin had his 488th career goal. In overtime both teams committed a penalty giving the other an opportunity at 4-on-3. Neither capitalized, sending the game to a shootout. Nicklas Backstrom played in his 600th NHL game. Backstrom has earned 11 points in his last 10 games. Braden Holtby played in his 200th NHL game. Holtby ranks first among active goaltenders in wins through his first 200 NHL games (118). Barry Trotz earned his 621st NHL win, passing Bryan Murray (620) for 10th place on the all-time NHL coaching wins list. Trotz has posted a 64-31-13 record with Washington and a 621-510-60-113 record in his career. NEXT GAME Caps hit the road again for a three-game set, starting with the Florida Panthers on Thursday at 7 p.m.